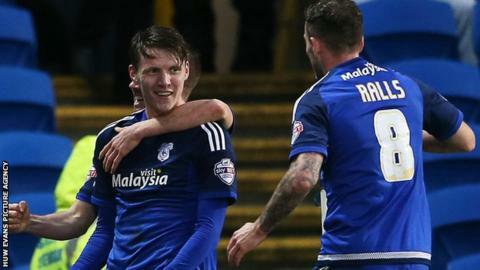 Cardiff City boosted their play-off hopes by beating Blackburn to claim a first win in four Championship matches. Anthony Pilkington and Joe Ralls mustered the only two meaningful shots as Cardiff shaded a goalless first half of scarce quality. Joe Mason made the breakthrough for the hosts, scoring on the rebound after Craig Noone's shot was blocked. Cardiff are now ninth in the table, four points behind the play-off places, while Blackburn drop to 17th. The Bluebirds dropped Kenwyne Jones as the Trinidadian striker held talks with an unnamed foreign club, paving the way for a first start since November for his fellow joint top scorer Mason. He and his strike partner Tony Watt struggled to impose themselves on a disjointed first half, with the sticky Cardiff City Stadium pitch - which has drawn criticism - making it difficult to play passing football. Cardiff conjured the first half's best efforts on goal - Pilkington's shot well saved by Jason Steele and Ralls curling one over - but it remained goalless at the break. Blackburn's attacking threat was limited to set-pieces, and Shane Duffy's header 10 minutes after the restart was comfortably held by David Marshall. The home side eventually broke the deadlock after an hour. Noone cut inside from the right wing and saw his shot blocked on the line by Duffy, but Mason pounced on the rebound to score his sixth goal of the season, and his fifth in as many appearances against Blackburn. Watt had two good chances to double Cardiff's lead and, although both efforts were well saved by Steele, the Bluebirds held on to their victory with relative ease. "I thought the game was a little bit flat in the first period but you have to take into consideration, it was very difficult on that surface to move the ball quickly and with any intensity and tempo - for both teams, not just for us. "What was pleasing, despite the busy programme, was we came out in the second period and really got on the front foot. "Pleased, delighted with a clean sheet. We've won at home - we're proving to difficult to beat, and that's important to us." "I felt we should have had a stonewall penalty, I don't know how the referee missed it but I am not going to complain about it and get into trouble. "But you are always concerned with a run of results like this, our form is not good, we have lost the last three. "I have seen every player now and everyone has had a chance to show what they can do - and if you do not perform when you have those chances you will not play. That is football." Match ends, Cardiff City 1, Blackburn Rovers 0. Second Half ends, Cardiff City 1, Blackburn Rovers 0. Substitution, Cardiff City. Sammy Ameobi replaces Tony Watt. Attempt saved. Tony Watt (Cardiff City) right footed shot from the centre of the box is saved in the bottom left corner. Assisted by Anthony Pilkington. Offside, Blackburn Rovers. Ben Marshall tries a through ball, but Nathan Delfouneso is caught offside. Foul by Stuart O'Keefe (Cardiff City). Substitution, Cardiff City. Stuart O'Keefe replaces Joe Mason. Corner, Blackburn Rovers. Conceded by Bruno Ecuele Manga. Ben Marshall (Blackburn Rovers) wins a free kick in the defensive half. Substitution, Cardiff City. Fabio replaces Lee Peltier because of an injury. Offside, Blackburn Rovers. Markus Olsson tries a through ball, but Nathan Delfouneso is caught offside. Attempt saved. Tony Watt (Cardiff City) right footed shot from the right side of the box is saved in the bottom left corner. Assisted by Aron Gunnarsson. Aron Gunnarsson (Cardiff City) wins a free kick on the left wing. Substitution, Blackburn Rovers. Darragh Lenihan replaces Lee Williamson. Attempt missed. Craig Noone (Cardiff City) left footed shot from outside the box is close, but misses to the right from a direct free kick. Shane Duffy (Blackburn Rovers) is shown the yellow card for a bad foul. Foul by Shane Duffy (Blackburn Rovers). Tony Watt (Cardiff City) wins a free kick in the attacking half. Hope Akpan (Blackburn Rovers) wins a free kick in the defensive half. Foul by Tony Watt (Cardiff City). Corner, Cardiff City. Conceded by Hope Akpan. Corner, Cardiff City. Conceded by Craig Conway. Hand ball by Tom Lawrence (Blackburn Rovers). Attempt blocked. Jordan Rhodes (Blackburn Rovers) right footed shot from outside the box is blocked. Joe Ralls (Cardiff City) is shown the yellow card for a bad foul. Tom Lawrence (Blackburn Rovers) wins a free kick in the attacking half. Foul by Lee Williamson (Blackburn Rovers). Anthony Pilkington (Cardiff City) wins a free kick in the attacking half. Substitution, Blackburn Rovers. Nathan Delfouneso replaces Bangaly-Fodé Koita. Goal! Cardiff City 1, Blackburn Rovers 0. Joe Mason (Cardiff City) right footed shot from the right side of the six yard box to the centre of the goal. Attempt blocked. Craig Noone (Cardiff City) left footed shot from the right side of the box is blocked. Assisted by Joe Ralls. Attempt blocked. Bangaly-Fodé Koita (Blackburn Rovers) left footed shot from the centre of the box is blocked. Attempt missed. Tony Watt (Cardiff City) left footed shot from outside the box is just a bit too high. Assisted by Joe Mason. Attempt saved. Shane Duffy (Blackburn Rovers) header from the centre of the box is saved in the top right corner. Assisted by Ben Marshall with a cross.